A young Muslim terrified by nightmares until he is introduced to Isa (Jesus). A former leader in a fundamentalist Muslim movement that persecuted Christians. A privileged young Muslim woman who is held captive by her family when they find a Bible in her possession. In his most incredible and eye-opening book to date, Brother Andrew invites you to meet these brave men and women you never knew existed. This is the riveting true story of the Church in Islamic countries struggling to come to grips with hostile governments, terrorist acts, and an influx of Muslims coming to Christ. The names and places have been changed to protect the real people in the real places. 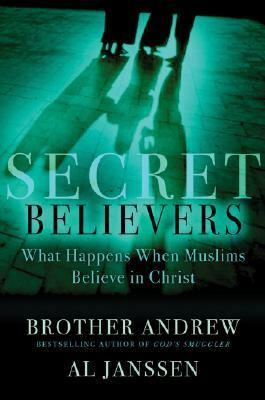 But the stories are true.Secret Believers not only gives you a glimpse of the lives of these courageous believers, it also proposes four practical initiatives for Christians in the West to help these persecuted brothers and sisters. It calls us to join a new kind of jihad, leaving vengeance behind in favor of forgiveness, radical love, and unyielding prayer. 'œBrother Andrew and Al Janssen reveal the amazing stories of those who witness the love of One they once refused and passionately searched until they found Him, even in the face of great opposition. Theirs is a testament to meekness, grace, and triumph, and a call to every follower of Christ to mirror their example. ''”Ravi Zacharias, author and speakerJanssen, Al is the author of 'Secret Believers What Happens When Muslims Believe in Christ', published 2007 under ISBN 9780800718749 and ISBN 0800718747.